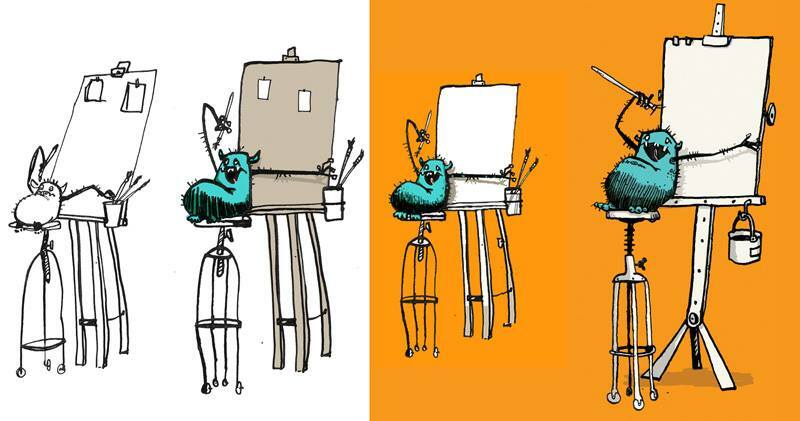 So how do you get published by an award-winning children’s publisher? It seems like a very good time to sit down and have a chat about breaking the rules and the journey behind Mrs Mo’s Monster. Paul Beavis is reading at the Auckland Writer’s Festival this Sunday at 12 noon and 1.05pm. Julia Marshall: What does it feel like, being published for the first time? Paul Beavis: It’s like wearing a new pair of shoes; it still doesn’t feel like me. It doesn’t feel like it’s my book out there. My book is this kind of scruffy thing I sent in and we worked together on. I had been working on getting a children’s book published for close to 12-13 years. PB: There was a cut-off date for unsolicited manuscripts on 24th April last year. And I had a version which was still very rough; and I was working on a better version, but I thought I haven’t got time, and they are just down the road, so I printed it out, rushed it down to Gecko and dropped it off. JM: I was mortified to hear from Paul that you almost didn’t send us your manuscript. We were receiving so many manuscripts, and they were piling up and piling up … so we thought we would just test to see what would happen if we said only send us your picture book MS if you’ve been published before, if someone in the industry says it’s worth a shot or if you’ve been through a MS assessor. All these ‘no’s’ were to try to whittle the rejections down. You didn’t fit any of those criteria. JM: It’s a difficult thing, the rejection letter. We do have a standard rejection letter, mostly because it is not possible to give good feedback in a short time. PB: And I kept the postcard, it’s the Who’s Hiding one. JM: Now we have a Mrs. Mo postcard for all our submitted stories. PB: I had picked up Gecko Press books in the UK, but it wasn’t until I came over to New Zealand that I recognised the name. My girlfriend, a teacher, had taken me to Children’s Bookshop in Kilbirnie. And there I found I am strong and Death Duck and the Tulip and Poo Bum and I thought ‘who the hell is publishing all these? I really didn’t think you would be interested, that’s why I took so long to send something off. JM: : It was a very collaborative process publishing Mrs Mo. The whole thing was very, very nice, and we had enough time, and we also worked with Vida Kelly. When it arrived I thought ‘this is good’ and it made me laugh, and was light-hearted. I know you didn’t think it was about manners but it is to me, at least a bit. Paul says it is about children trying things out for themselves. So we were good with the ‘yes’, and it was a lovely process working with Vida Kelly. PB: When first going in to Gecko to meet Julia and Jane, I knew that it was the right home. Occasionally I threw my toys out the pram on certain things, but some of the suggestions were just spot on. Particularly with the ending. JM: We cut out a gatefold and stretched the ending. PB: The whole end line was all on one spread, and Julia, Jane & Vida wanted to take the end line and put it on a single page. I didn’t think it would work. JM: I wanted to be able to turn the page and have the pause, because that’s important. We’ve been thinking about it with digital books vs physical books, the importance of the pause, and what’s on the page and what’s not on the page. PB: Reading the book to a live audience, you do suddenly realise the power of the page turn; it’s one of the strong points of the book. JM: And when you read it out at the launch. That can be a moment when you realise it is either a goer, or it’s going to be a nice book but… Sometimes you don’t know that until the last moment. 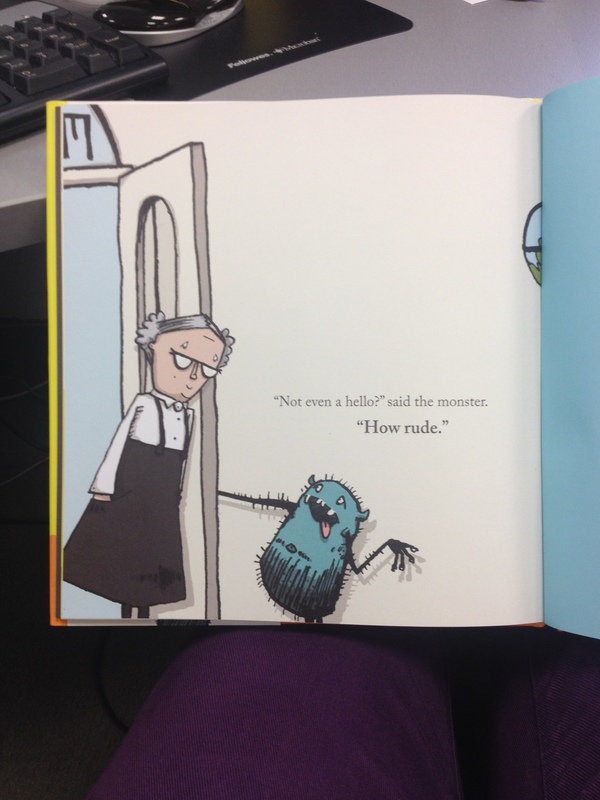 PB: In the latest reading in Gisborne, I actually brought two of the younger children up and they read the Mrs Mo part and the monster part, and I filled in as the narrator, and there is a dynamic to the story where it says; ‘and off he ran.’ That works well as a narrator. And you do the page turn, and the kid starts again, and you find all these extra levels, that may have been there, but they weren’t really planned, happy accidents, uncovered through editing, until there’s just the bare minimum of text. JM: The genius of simplicity. There’s a wonderful bookshop in Newcastle, Seven Stories, she/the owner immediately connected Mrs Mo’s to The Tiger who Came to Tea and said it was going to work really well as a read-aloud, and they are very much a read-aloud kind of a bookstore. JM: We have never published a first-time author before because we normally choose books that are fully-formed. For me it was difficult to choose a half-formed book because it hadn’t got to its final stage. There is a leap of faith in there, and it’s only now that I am more confident about the leap of faith required. PB: I understand looking at earlier versions, why rejections came back from publishers. It was quite empty-looking, there was not much text. And that is why reading Duck, Death and the Tulip filled me with so much confidence. PB: Working on the cover was a really good collaborative process of sending stuff through to you and Jane and Vida. My friends in the UK who work on picture books said it took about 3 months to do the cover and I thought we seem to have a very tight timeframe to fit this cover in to. We turned it around quite quickly, I thought. Because it was a clear idea. JM: With the cover, I like it when it is my role to say ‘that’s not working for me. I don’t know what it is that isn’t working, but it isn’t working as it is’. That whole collaboration thing works well, especially when you are in the same town as the author. We had to stop Paul overthinking things. 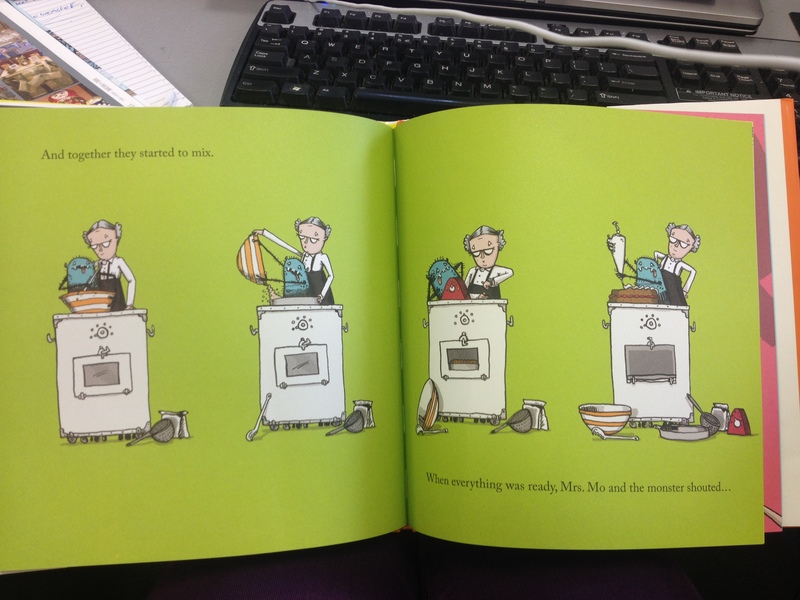 I got taught that long ago by Jill Livestre from Archetype. At the last minute I said, ‘I’d like to change that word,’ and she said, ‘You just remember that and focus on that word and you won’t see all the other ones you’d like to change’. PB: I had a black and white dummy I had worked up, and I have a notepad note saying ‘stop fiddling with it’. JM: Well, there is a stage that you get to, when another change is not going to make anything better. PB: You’re just over-egging the pudding. JM: I love that expression, over-egging the pudding. We don’t want to over-egg the pudding. I am always a bit careful about exclamation marks and I think they are very easy to overuse. There’s the line that sticks with me; ‘An exclamation mark is like ketchup, good meat don’t need it, and bad meat don’t deserve it.’ And so always I try to take away the ! and see whether the sentence is strong enough without it, or is it a really working-hard ! I took the story while I was editing to Julia Eccleshare who is a Guardian reviewer, and she said no, get rid of them. So I was happy. JM: When the book was released, that was terrifying for you, wasn’t it? PB: This is what I was told by people I know who work for big publishers; they’ve got a book coming out every week, or two weeks. Whereas Julia and Jane have got one a month coming out. And they don’t over-egg the pudding with their books. That was a bit of a blind panic, but I panic easily. JM: It was a blind panic, but you’ve got to have all your eggs in… all your ducks lined up, and if you are missing a duck, its hard to put it back again. PB: Using the Facebook page to drive traffic, create downloads for people… all of that stuff is great, to build up interest. JM: Doing all that stuff, like how to draw a monster, it’s been a really great thing, because its so teacher friendly, and its funny. JM: We were reading it out a lot. I’m most comfortable with text, Vida with illustration. For me, not showing in the text what you are saying in the pictures, that’s what I’m busy with. PB: At one point we were thinking of removing the line ‘And together they started to mix’, then we reinstated it and it became the perfect line. It was telling you the story, but there needed to be an introduction. JM: It was a lot more waffly. We took out slight moralnesses. It’s nice that process, when the text is fully yours. The phrase that is repeated ‘What is this you do’ – technically you could edit that down, but it is necessary to the voice of the monster. PB: I didn’t mind anything being changed, but I didn’t really want that line to go. When it got to that part of the discussion in the email, Julia said: technically this is wrong, but it sounds right. It was a real confidence booster finding those guys knew the story. It wasn’t just a matter of changing the pictures, but the text as well. JM: Publishers aren’t always very good at saying what we do, but I think the process where you have more than one person working on something, and giving it their absolute best and their undivided attention… and that collaboration where everybody has confidence in everybody because there is no ego, but everybody bringing a special care and knowledge. 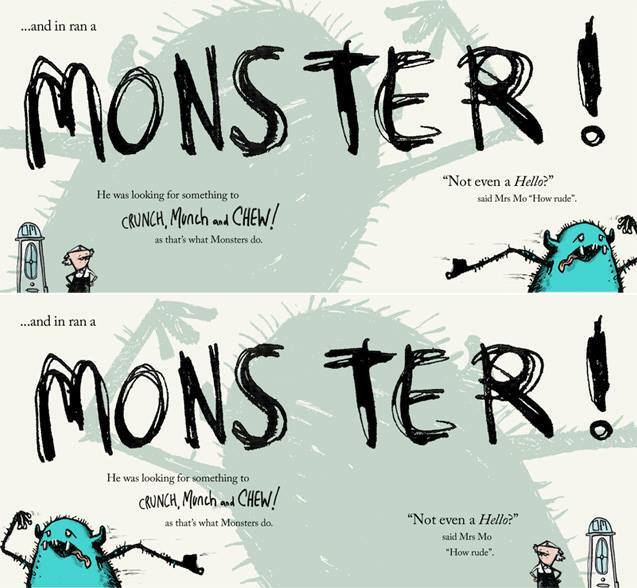 PB: Without the collaboration with Gecko Press, Mrs Mo’s Monsters wouldn’t be near this good. I still look at it and wonder how it got made. Thank you to Julia and Paul for this amazing insight into the first-time publishing process. The full interview is available here for those who are interested. If enough people are intrigued by this piece, I will publish a follow-up about the submissions process for various publishers, as Julia and Paul both had a lot of interesting things to say about this process. Please leave a supportive comment below! 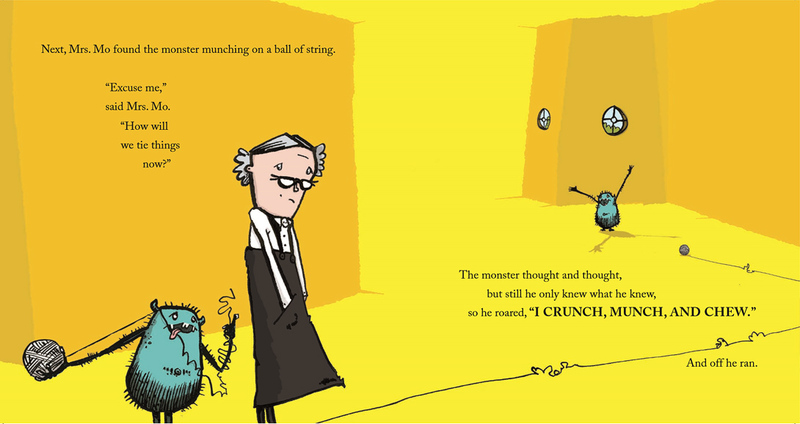 Check out www.mrsmosmonster.com, and follow the Facebook page here for more about the book and its creation. 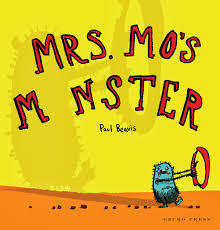 You can win a copy of Mrs. Mo’s Monster here. This entry was posted in Auckland writers festival, Author interview, NZ Writers Festivals, Tools for bookshops and tagged first-time author, Gecko Press, julia marshall, paul beavis, publishing by booksellersnz. Bookmark the permalink.